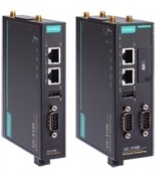 Moxa’s UC-3100 Series industrial computers can be used as edge-field smart gateways for data pre-processing and transmission, as well as for other embedded data acquisition applications. The UC-3100 Series includes three models, each supporting different wireless options and protocols. The UC-3100’s advanced heat dissipation design makes it suitable for use in temperatures ranging from -40 to 70°C. In fact, the Wi-Fi and LTE connections can be used simultaneously in both cold and hot environments, allowing you to maximize your data pre-processing and data transmission capability in most harsh environments. In addition, TPM v2.0 uses a hardware chip to boost data security, making it highly unlikely that hackers will be able to steal your data, either remotely or locally. The UC-3100 is more than just a hardware solution. In order to offer a better user experience with a Moxa RISC computer, the UC-3100 supports the following software features, allowing you to use the most suitable configuration based on your particular application. In addition, Moxa provides 10 years of Linux OS support* from Moxa’s customer support engineers. With a new version of the Debian repository released on average every 2 to 3 years, long-term Linux OS support helps you create a reliable solution that will be supported now and long into the future.